We have so many events this month, eh? Forum Vijaya Mall is having a food festival that goes beyond a particular cuisine and looks like they also have a cooking demo and stuff. I might be going sometime and will update, but till then, here is a snapshot of what the event supposedly is. Chennai: Get ready to get a taste of a global palate only at The Forum Vijaya Mall. 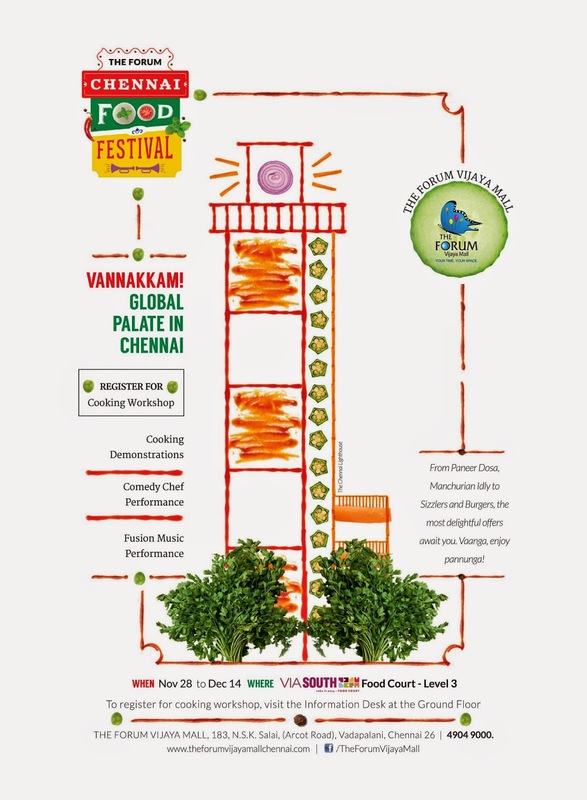 The Forum Chennai Food Festival will take one on a culinary journey under one roof, at Via South – Food Court. From Mozhaga Bajji, Chaat Platter, Rasa Paniyaram to Sizzlers and Subs, we have a range of delicacies starting from Rs. 30! The food festival also includes cooking workshops, demonstrations, comedy chef performances and fusion music. The outlets participating in the event include Arab Kitchen that specializes in middle eastern food, Dhishoom that serves authentic North Indian street food, ID that’s a delight to South Indian cuisine fanatics, Kailash Parbat that specializes in Chaat and North Indian Vegetarian dishes, Kobe Sizzlers, Pandikadai that brings authentic Madurai food to Chennai, Wangs Kitchen and Quiznos for those who would like to go healthy with a Sub. Meanwhile, to register for the special cooking classes, call 4904 9000.